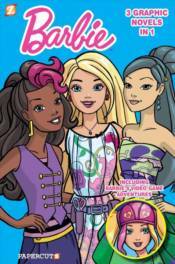 Three complete Barbie graphic novels in one collection! Barbie is on the career path in all-new adventures! This all-new 21st century take on Barbie tells the story of a young woman struggling to start her fashion career. Will she be a designer, a photographer, a model? Barbie doesn't know yet but there is one thing she does know - girls can be anything! Plus, Barbie enters the world of coding... inside a video game as she skates around the game to rescue her lost friend in Barbie Video Game Hero, a bonus story inspired by the Barbie movie!